Holds 12 standard size trays. 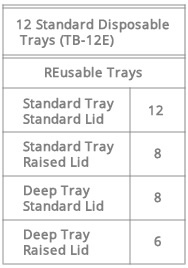 Holds up to 12 REusable trays (see chart below). 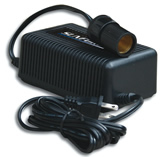 ✓ Plugs into your vehicle accessory outlet or cigarette lighter. ✓ Fast heating without any additional preheating steps. ✓ Just pack the meals… plug in and go! Stable heat of 160° when bag is zippered shut. Adds heat back as meals are removed for delivery. Built-in, moisture-safe, fully insulated electric heater wraps around the entire bag. 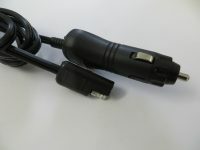 Replacable 8ft cord makes plug-in easy. Front pocket for cord storage. 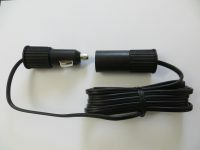 May be used with AC to DC Power Converter (6 amp). Abrasion and fluid resistant outer shell of waterproof 1000 denier vinyl-coated nylon. Inner wall is waterproof 400 denier coated nylon. High-strength zip-in liner of pin-hole free vinyl for use with hot or cold meals. All liner seams are heat sealed for easy cleaning. Liners are replaceable. Durable, adjustable shoulder straps of 2″ nylon webbing with long-lasting metal buckles for strength and security. 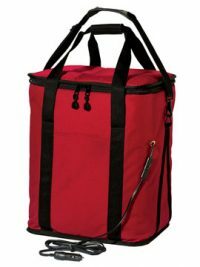 Reinforced straps are securely sewn onto the bag and down to the bottom for optimum support and strength. Price includes 8ft cord, bag, liner, and bottom tray. 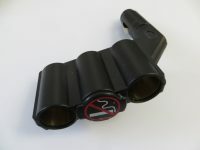 Replacement accessories are listed in the Accessories section. 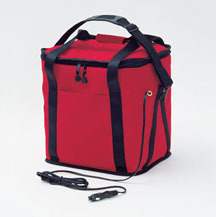 Allows you to plug your electric thermal bag into any household outlet (rated 6 amp). Bag runs off electric 12V DC power (Car). Uses only 5.5 amps of power! Won’t hurt your battery.